And lucky for me, she is NOT a monster-in-law. Far from it. Nancy is kind, thoughtful and non-interfering. Non-interfering is so key when it comes to relatives and boy did I hit the jackpot! Hubby and I were married for seven years before I got pregnant with Firstborn Daughter and no one — not my parents, or Hubby’s parents, or my siblings, or ANY relatives — ever asked us when we were going to have children. It was such a blessing to be allowed to have that time together without our families breathing down our necks. I still appreciate that after all these years. Nancy is often part of the big clan of family that joins us at Thanksgiving. (And in a stroke of major good luck, Nancy moved just a mile away from us this year so now it is not just Thanksgiving that she joins us!) 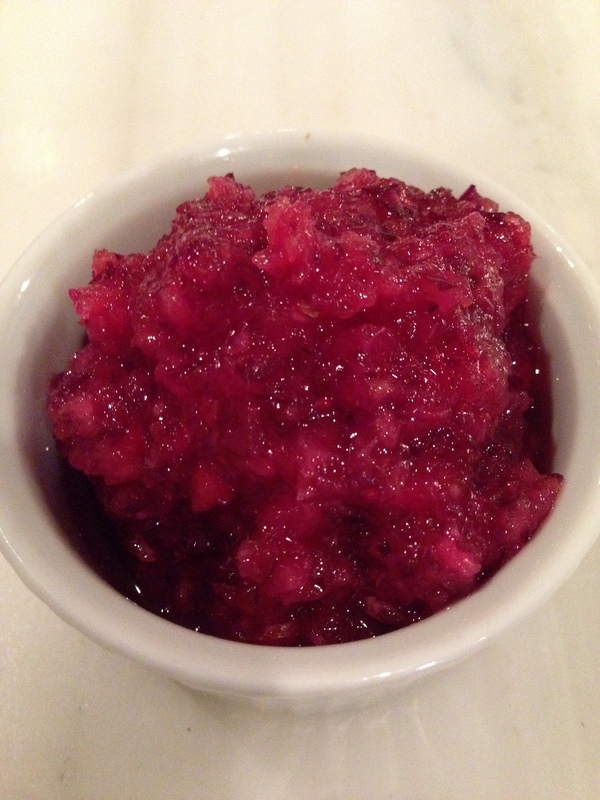 One year, Nancy brought us a delicious raw cranberry relish that has been part of our repertoire now for a dozen years or more, all through the cranberry holiday season. It is fresh, tart and tasty and is a perfect compliment to a plate of warm comfort food or in a salad or even on a dessert! This season, I served it for Thanksgiving, and on persimmon cake at a dinner party, and in sweet potato soup for Hubby and me. I eat it all through November and December and absolutely LOVE it. In addition to it being delicious, the recipe is also astoundingly simple. A mother-in-law who I love to have around and who brought me one of my favorite recipes. What more can a girl ask for? Put cranberries and orange pieces into a food processor and blend until finely chopped. Add sugar, pineapple and port and process again to thoroughly blend. If your processor is small, process in portions and blend all together in a large bowl. Refrigerate for 24 hours, stir and serve. Keeps well in refrigerator for 3 weeks or more. Try on vanilla ice cream. Really great quick dessert. Thank you, Cynthia–I am honored!